Declines in population size can compromise the viability of populations by reducing the effective population size (Ne), which may result in loss of genetic diversity and inbreeding. Temporal population genetic data can be a powerful tool for testing the presence and severity of reductions in Ne. The Gouldian finch (Erythrura gouldiae) is a flagship for conservation of Australian monsoonal savanna species. This species underwent severe population declines in the twentieth century due to land use changes associated with European colonization. Microsatellite and mitochondrial genetic data from Gouldian finch samples sourced from natural history collections prior to land use changes were compared with contemporary samples to estimate the severity of decline in effective population size and to detect changes in gene flow. These data show that Gouldian finch decline was not as severe as some sources suggest, and that population genetic connectivity has not changed following land use changes in the twentieth century. Multiple estimators of current Ne using genetic data from consecutive years suggest the Gouldian finch Ne is likely between a few hundred and a few thousand individuals, with some estimates within the range considered of conservation concern. This work has identified the need to genetically characterize populations in Queensland, and to understand critical demographic parameters (e.g. lifespan) in the Gouldian finch. 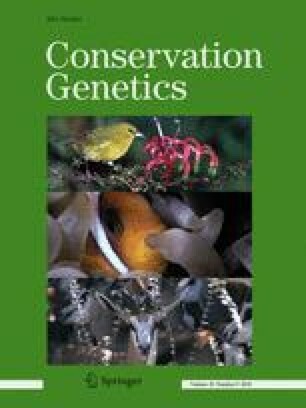 Understanding these factors is vital to further improve genetic estimates of population size, key to the formation of appropriate conservation management of this species. The online version of this article ( https://doi.org/10.1007/s10592-018-1051-1) contains supplementary material, which is available to authorized users. We thank all those who have contributed to the collection of blood samples in the field including Gareth Davies, Jo Dessmann, Christophe Dufresnes, Rowena Hamer, Catherine Hamilton, Jan Lewis, Dhanya Pearce, Sarah Pryke, Marjolein Schoe, Nina Svedin, Erica van Rooij, and Hanneke Wiggers in Wyndham. We thank staff of Australian Wildlife Conservancy, in particular Joanne Heathcote, for assistance with fieldwork at Mornington Sanctuary and Northern Territory. Thank you to all the museum staff that contributed to the collection of toe-pads including: Maya Penck at South Australia Museum; Paul Sweet, Thomas Trombone, Joel Cracraft at the American Museum of Natural History; Katie Smith and Karen Roberts at Museum Victoria. Caitlin Morrison extracted DNA from historical toe-pad samples. Thank you to Drew Allen and Dave Nipperess for discussions about rarefaction and comparison of diversity indices, to Nicolas Dussex for help with priors for Approximate Bayesian Computation. The funding bodies for this work played no role in the conception, design, or interpretation of this work. Financial support for fieldwork at Wyndham was from an Australian Research Council Grant to Sarah Pryke and SCG (DP0881019), Save the Gouldian Fund, and a Macquarie University Research Excellence Scholarship to JB-B. Funding for fieldwork at Northern Territory and Australian Wildlife Conservancy’s Mornington Sanctuary was from Australian Research Council Linkage Grant to Stephen Garnett (LP0668122), supporters of the Australian Wildlife Conservancy, the University of Wollongong, Northern Territory Department of Infrastructure, Planning and Environment, Charles Darwin University, Stuart Leslie Bird Research Fund, and the Professor Allen Keast Award (Birdlife Australia). The Australian Agricultural Company, Australian Department of Defence, Australian Wildlife Conservancy and Jawoyn association allowed KLM access to their land. The genetics work was supported by Australian Research Council grants to SCG and LAR (DP130100418), and an Australian Postgraduate Award to PEB.